By Paul Deng in Currency on January 2, 2008 . It’s a brand new year. I thought I’d have some big-picture review of what’s going on in the world economy today. Here is my first piece on US dollar. 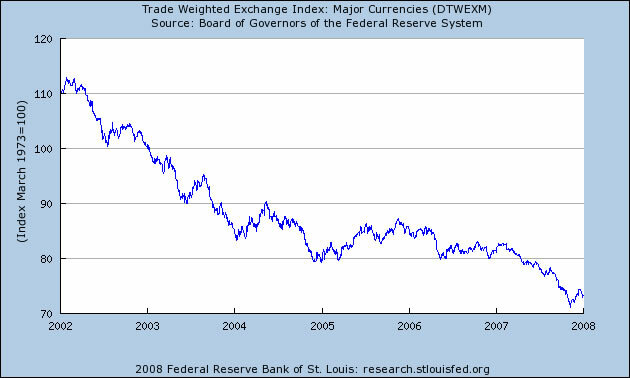 The graph below will scare you a lot…in fact, the dollar index fall from 115 in 2002 to mid 70s at the end of 2007, that equals a 33% drop. Hmm, a sharp drop, isn’t it? But wait a minute, have we witnessed the similar happened before? Let’s look at the following graph and have some historical perspective. From 1985 to 1989, the trade-weighted dollar index actually had a bigger fall, from 145 to 90, almost down 38%, and it fell even further until 1995. One more graph. If we just look at the FX between US dollar and Japanese Yen. 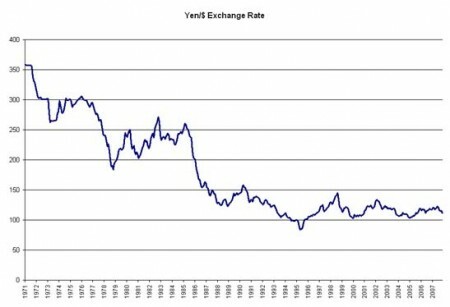 The previous drop was even bigger: from 260 yen per dollar in 1985 to around 125 yen/$ in early 1989 (anyone remember Plaza Accord? ), that’s a stunning 55% drop (maybe I should use the word “collapse”). 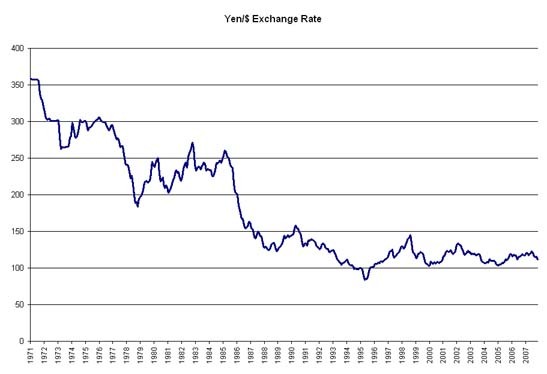 In fact, the Dollar against the Yen continued to fall until mid 1995, touching 90, and since then fluctuated in the 100 -150 range. 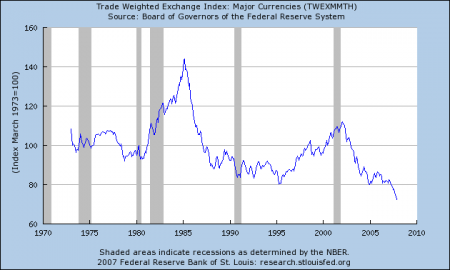 First, today’s weakness of US dollar is not unprecedented. So do not panic. From a contrarian investor’s point of view, when everybody is crying out in one direction, you probably should start to think about the other direction. However, this rule does not apply to FX between $ and Chinese Yuan. Yuan is set to appreciate even more. Second, US dollar is still the world’s dominant currency, and it will remain so in foreseeable future. The dollar’s up-and-downs largely reflects the stance of U.S. monetary policy and cyclical feature of underlying economy. Large US trade deficits do not necessarily lead to large drop in currency value, especially when you consider in the process of depreciating, export surges thus improves current account. I’ll have a piece on Yuan next time. Your comments are welcome.